Hello friends, some musing here... if you're not in the mood, well click away. I struggle so much with this blog, with bringing form and definition here. I've been thinking about it so much lately, almost getting here, wanting to get here, vowing to get here and wondering to myself, what is this blog about, who is it for? I need clarity. Is it for me to wonder aloud and share my inner musings with you? Is it a place to follow our family life through the year? (That is a bit challenging because my children are getting older and they are not keen on being seen on the blog.) Is it a place to share glimpses of the rhythm of life as it unfolds here, where I live? Is it a place to share elements of my program Celebrate the Rhythm of Life? 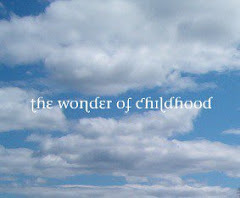 Is it a place to share The Wonder of Childhood? Is it a place to answer your questions? My e-mail is full of requests for how do I help my child with this or what about that, what do you think? I strive to respond to you all, yet it is becoming overwhelming with the volume of mail I am receiving. I've thought about doing that here, anonymously, of course. So much possibility. So much expansive possibility at this time of year. I feel like the five pointed star, arms and legs out, impossible to draw in and focus, so much out there, pulling me outwards. You know the look, the feeling of being stretched out...? 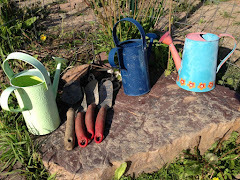 I've looked around the blog world and mused at the history and connection making with theme posts like Corners of My Home, I love this, to peek into others' homes or The Simple Woman's Daybook, and I love to see how other homeschoolers are doing it too. I love to see your gardens and your cooking and read your musings. So this is my little effort at this expansive time of year to bring some cohesion to my thoughts and focus here and to my deed, writing with clarity. At the end of all this whining, what comes to mind is to just "do it!" to show up and write and if I bore you, well perhaps you won't come back next time, and if I write often enough, perhaps you will give me another chance. 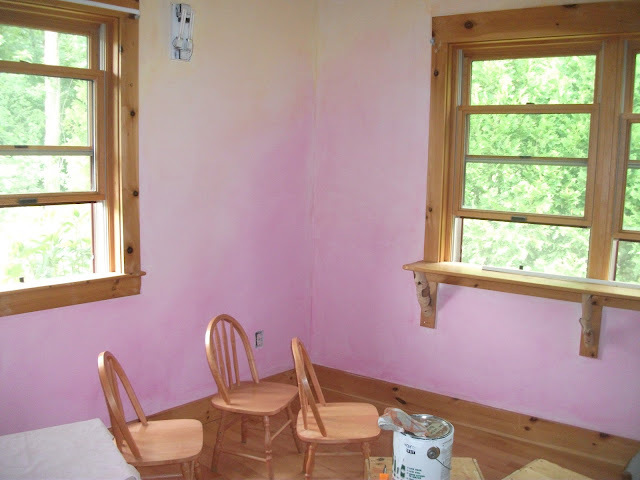 This weekend I have been enveloped in color doing lazure painting. It has been so uplifting, not tiring at all. And right now I am working on a talk on The Senses of Childhood, what they are and why they are important and this is a lead in to my talk on Circle or Ring time play with Young Children and the Grade School Child which is a piece of our planning out the year in Celebrate the Rhythm of Life with Children Program. I want to bring my camera outdoors and photograph all the blossoms that opened this week at the solstice. What blossom splendor! Morning glory, borage, poppy, my grandmother's day lily, thyme, it's like the whole world just opened up to receive the warmth of the sun this week. That's another blogpost. And now it's raining ~ hard. I'm wanting to empty the house, room by room, wash it and paint it and then chose with care just what it is I want to live with. This is the longest I have spent in one house in my adult years. We have been here for ten years and I love the intimacy that comes with living in a place year after year, noticing where the sun moves through the year, noticing what grows where, where does the catnip pop off the sprout again next year? where the nettles rise, seemingly carried by the wind. Over the years I've come to see that this is the week to scrub down the north facing walls and corners of the house because the sun reaches those places and can really dry them out after a good scrubbing. Okay, I've let it all out, fitting for Moon day, day of reflection. I' love to hear from you, why do you blog? How do you bring focus? How do you stay on track with it? What inspires you? Love to hear from you below. I love this post. For me, it illustrates why I come to this blog, so much insight and musing about many things. I used to look at lots of blogs and search for crafts, thoughts on homeschooling, etc. But I find now I am here and just a few others that delve deeper into a topic . Your pieces are so rich with information and honest thought. I will keep reading, whatever you chose to write. Lovely post. I found your blog only a short time ago, but am glad I did. I began blogging a few months ago, wanting to be another voice to echo the sentiments of slowing down childhood, being a gentle parent, and other musings on homeschooling and parenting, but have found it difficult to share my opinions publicly. I often wonder what I am really doing in cyberspace. LOL. Oh good, we are in the company of each other wondering what we are doing in cyberspace. Fortunately there are no bears! Blessings on your blogging endeavor and all your hikes Rachel. Well, I know you wrote this a week ago and may be in a different place now, but I relate and have related to this sort of musing on and off the entire time I have been a blogger. Sometimes I feel like throwing it all in and sometimes I am on a creative sharing roll that seems well received. I always come back to the place that my blog is whatever I want it to be in the moment and as long as I am true to myself and I document what I want to remember, then that is good enough. I will happily read any and all you mentioned possibly sharing. I love reading other people's experiences, seeing their homes, gardens, reading their wisdom, etc. That all said, it takes time and I have noticed my own blogging (writing and reading of others') has been sporadic lately, because I have been giving other things my time and attention. That is how it is with blogging, for the most part! I look forward to reading more of your posts, whenever you post them and whatever you write about! Oh thank you for stopping by and sharing your kind words Nicola, the timing is perfect. I am still wondering.I am so glad to have found your blog too!